"The main thing was to be beat German (Fernandez)b ecause I knew that he would be in good shape to do it. It doesn’t matter if he hasn’t run a race in a year. He is going to be fit. I figured coming down to the last 800 that the record would come down to which ever of us was ahead at that time"
Chris Derrick, the new American junior record holder at 5k, after he ran 13:29.98 to defeat German Fernandez and smash Galen Rupp's (13:37.91) record. Josh Mcdougal - where he at? Centro, Sixth Fastest 1500 in NCAA History!! This meet didn't disappoint. Third place of heat 2 of the 5k may have been the highlight as Chris Derrick defeated fellow frosh German Fernandez to get Galen Rupp's American Junior Record in the 5k. Jenny Barringer has been so good in 2009 that she set a collegiate record while running slower than she did indoors. The premier pre-meet event, the men's 5k, didn't quite live up to its hype as a slow second mile killed any chances of a World Championships "A" qualifier, as Alistair Cragg outkicked Matt Tegenkamp to win in 13:22. 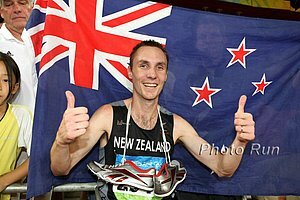 Videos from top races from Runnerspace on the right of the home page and more from Flotrack. 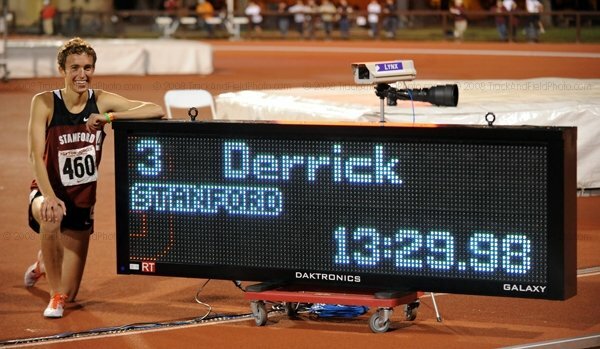 Chris Derrick American Junior Record 13:29.98!